Sharing his more than 25 years of Hotel and international culinary experience, Chef Manny began his culinary journey working at the "Sonesta Beach Hotel" located in Key Biscayne where his interest quickly turned into a passion. It was then that his passion for cooking lead him to Culinary school in Chicago. Moving back to South Florida early 1990 and hitting the South beach scene, working among the greatest Chef's and Restaurant's in that time. Chef Manny along with Corporate Chef Gerald Drummond were respondsible for opening "China Grill" in 1996. Then went along working for George Hamilton at "Hamilton's" in the Hyatt Hotel located at Downtown Miami, Also opening the well-known B.E.D (Beverage,Entertainment,Dinning), Touch Restaurant and becoming Kitchen Manager at Jerry's famous Deli. Landing as Executive Chef at "The Prime Grill 18 Kosher Steakhouse". Down his journey opening a few more restaurants as Executive Chef for "Roasters N.Y Deli" along side with Corporate Chef Pedro Rosado. 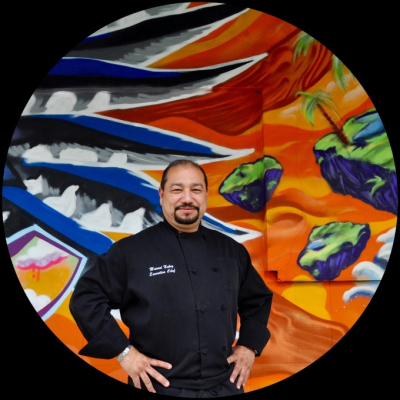 Chef Manny was born in a family of extreamly talented cooks, and started experiencing the Arts of Culinary at a very young age. He learned the secrets of great cooking from his parents, grandparents and extended family members. He viewed his traveling as an amazing, adventurous opportunity to gain more knowledge in different food and cultures, obtaining more expertise in different cusinies. The Art of Culinary industry became a real passion for him. Executive Chef Manny also works with local farmers helping the community. " I believe in doing everything from scratch and providing the most nutritious, freshest food products alongside with opening the doors to Miami Breeze Diner where my guests are welcomed in an honest way" Says Chef Manny.